"Didi Rounds are great for keeping noise out of baby/children's rooms and vice versa. 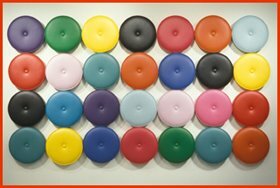 They are soundproofing padded discs upholstered in naugahyde and come in an assortment of different hues. Just channel your inner interior decorator to create a din-free environment in the color pattern of your choice and velcro on. Pretty simple. As an added benefit, use also as childproofing pads for walls." The didi rounds are cute. I'm glad I found your blog and will check in from time to time. My wife and I are slowly working on our house (room by room) and I would like to try to incorporate at least some noise-dampening design in each room. Getting a little off-topic, I think it's nice to have outlets in regard to noise issues, so thanks for maintaining this blog. I think there are lots of people in America who are extra sensitive to sound and the modern environment seems to get noisier all the time. One of the sad things is that people who don't have a problem with noise often take the stance that they don't understand what all the fuss is about. Our society assigns values to different problems and, for the most part, sound issues have traditonally been given a low value. However, over the last few years, I've noticed more and more people are willing to take a stand on the issue. ps: Don't forget to mention neighborhood watch groups as a great deterent to noise. We have one in our neighborhood, and we've worked with police to get rid of two local "party-houses" that were known for having really loud, late-night parties.